Did You Miss These Popular Posts on Writing? If you want to be inspired, challenged and entertained, read these four popular posts on writing which were published this month on WritetoDone. Just click on the headlines to read the post. This post by John Yeoman got a very strong response from our readers. We got over 50 comments. Authors do not write to change their reader, but to change themselves. Click to tweet. Take the quiz to find out. 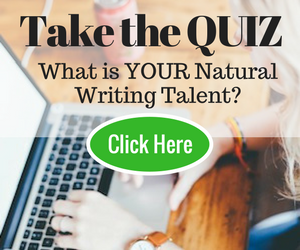 This fun quiz was part of a co-production with Grammarly and Daily Writing Tips. Just imagine going to lunch with James Patterson! One of our WritetoDone readers told me about his experience and I asked him to write about it. We got over 150 tweets and LOTS of comments for this post. People on social media went wild about this post! Author Dave Chesson really took the hard work out of creating great titles. This post created quite a heated debate! Check out the comment section and chime in. I hope you enjoy our selection of this month’s popular posts on writing, and find them valuable resources for your journey as an aspiring writer. If you have a moment, please share these posts with your friends on social media. great articles like it a lot. Very good advice. Thank you for them. I myself recently started writing posts. Although I prefer the article, because they have much to tell. I have not enough words that can fit in a few lines on some forum or blog. Recently read a very interesting article on this website how it should express their opinion. Of course those who used to advise me to write a major work, some of them have PhDs. I listen to the views of people as they really achieved a lot in the theme of writing. That only is writing a doctorate. I’m not sure that he could write their own similar work. Very good advice. Thank you for them. I myself recently started writing posts. Although I prefer the article, because they have much to tell. I have not enough words that can fit in a few lines on some forum or blog. Recently read a very interesting article on phdify.com how it should express their opinion. Of course those who used to advise me to write a major work, some of them have PhDs. I listen to the views of people as they really achieved a lot in the theme of writing. That only is writing a doctorate. I’m not sure that he could write their own similar work. The explanation is good and content is also more valuable one. I too really enjoyed this post!! really informative one!! keep on posting such good posts!! In fact, i enjoyed all of them especially What James Patterson told me about writing and the one that mentioned lots of useful Headline suggestion tools. Really great posts indeed :). Thanks for sharing these posts. I saw you over at Gary Korisko’s RebootAuthentic.com and thought I’d come here and say hi. I particularly like your first post about bonding with readers. Story telling is such a powerful way to communicate, isn’t it? Part of the beauty of telling a story is the power of the emotion writers can instill into the characters and their experiences. I heard that JRR Tolkien, author of the Lord of the Rings trilogy, wrote as a means of catharsis to heal himself from the ravages of WWI. It just makes you wonder, how much of an impact is personal experience on the beauty of writing and to a greater context, art in general? thanks for this tips…time to learn more..